I’m legitimately impressed with the recent Lyft app redesign on my iPhone. Somehow they collapsed the entire process of calling a car into just a couple screens, without making those screens feel overcrowded or overwhelming. On the contrary, the type is big and the copy is friendly and information is easy to gather at a glance. They’re surfacing just the right amount of info at the right time. It’s a pleasure to use now, feels faster and easier, and it’s one of the best refreshes I’ve seen in a phone app. This video demo of a mocked-up airline website of the future is stunning. A lot of people are focusing on this as a way of airlines to play travel agent, since there are city guides and hotel information, but the essence of what makes this demo great is the simple ease of use of planning air travel. I’ve gone from round-trip to one-way tickets in searches and lost all my data, having to start over from scratch (in the demo it’s a single click to change). 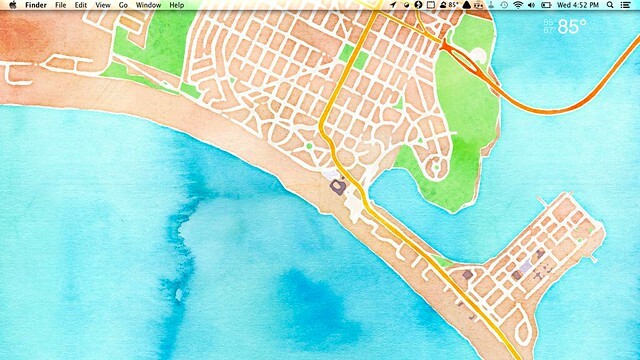 The way multi-city searches are built is also slick and way easier. Of all the parts of this demo I think are worth building, I’d say just the basic new flight search being quick and easy would be a game changer for the industry. 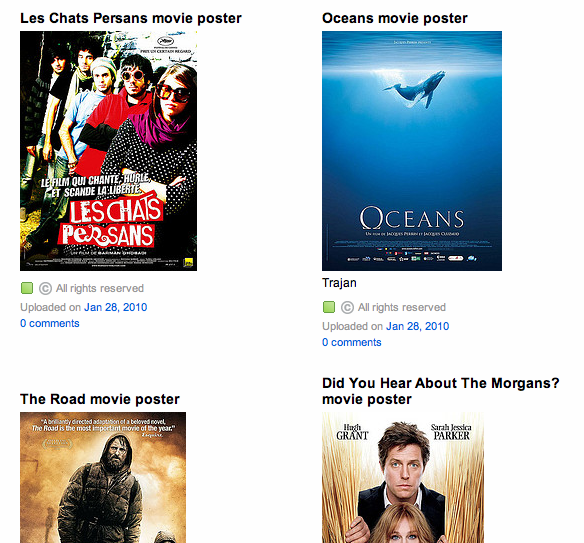 I love this flickr stream for the Belgian wing of The Font Shop mostly for the font identification in all the movie posters. Scan through a few pages of the archives and maybe you'll learn like I did that if you want a movie to seem serious, you gotta go with Trajan. upgradable and endlessly extensible through third party apps. Like Matt Jones said, it makes me feel like I have superhero powers (at least for information). It's my hypothesis that the powers that be in the mobile phone world are essentially a cargo cult. Somewhere in a boardroom 1-2 years ago a CEO screamed "make it black and touchscreen, then put a chrome bezel around it and the masses won't know the difference." iStockphoto ends up on a license plate! My new license plate, originally uploaded by mathowie. 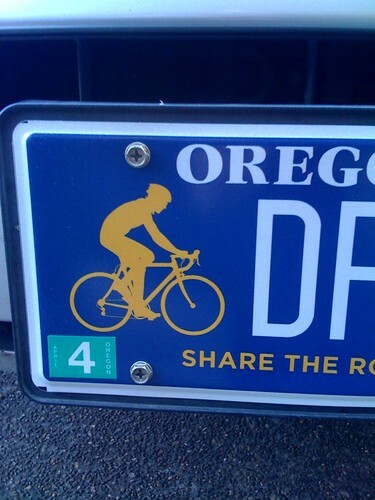 I love my new Share the Road license plate that is now offered here in Oregon. It's only $10 as a one-time fee and half goes to the Bicycle Transportation Alliance and half goes to Cycle Oregon, both bike-friendly organizations I support. I noticed it looked familiar when it showed up. I've been a casual user of iStockphoto for some time and I recently designed a site for a race series a friend was throwing (first race is this Saturday and I'll be there in the beginner class!) and I used iStockphoto to get that cool outline of Oregon and the cyclist profile (I used a slightly different illustration). When I opened the DMV envelope I instantly recognized the cyclist, because it's this file, just reversed, and with the water bottle removed from the outline. I'm not faulting the designer, iStockphoto is a great place to get super cheap illustrations and I use them all the time, rather, I'm more stoked that an illustration there ended up working all the way up to an optional state license plate. I went to the dentist last week and while I was still high off the fumes, I mistakenly said “yes” to doing commentary for this Friday’s upcoming Layer Tennis match. I’ve spent the better part of today reading up on old matches and following Rafe’s excellent guide to judging. This week they’re doing video with After Effects and since I know virtually nothing about actual motion production, I promise to be a completely clueless flailing treat to everyone.